It’s not surprising the Middle East is a mess 100 years after Sykes-Picot. It’s just the delayed but inevitable result of the fall of the Ottoman Empire. What Sykes-Picot hath wrought? 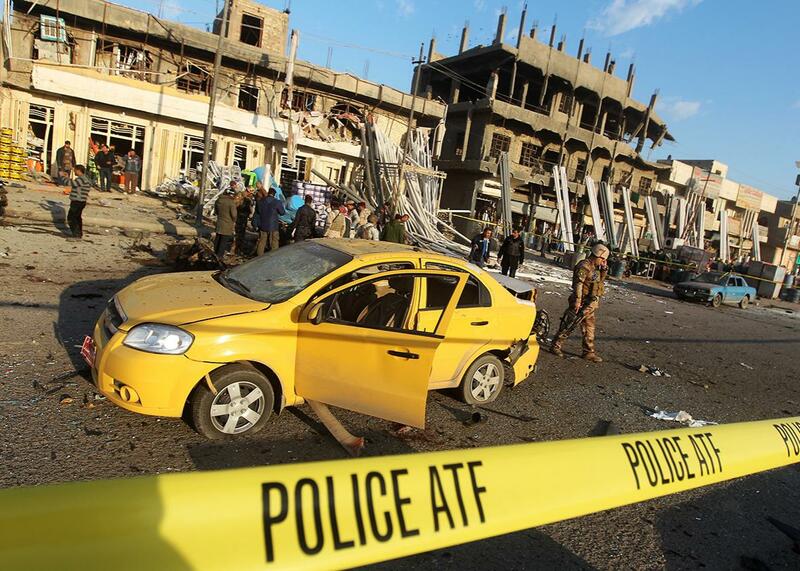 Iraqi security forces inspect the site of a blast after a bomb ripped through a group of workers in Sadr City in Baghdad on Jan. 24, 2012. Exactly 100 years ago, the French and British redrew the map of the Middle East, carving new borders for new nation-states to be led by pliant tribesmen after the end of World War I. On the centenary of this accord, known as the Sykes-Picot Agreement (after Mark Sykes and François Georges-Picot, the diplomats who devised it), many blame its outlines for the turbulence that racks the region today. Some political scientists have even drawn alternative maps, which they claim would have wrought a more durable peace. But these claims, and the whole long-churning debate over Sykes-Picot’s culpability, miss the main point—which is that any map imposed by outside powers would have sired dissension and war from some local factions. What really set off the conflicts we see today was the collapse of the Ottoman Empire, brought on by the First World War. Before the war, the countries now known as Iraq, Syria, Lebanon, Jordan, Saudi Arabia, Turkey, and Israel did not exist. They were all part of the Ottoman Empire, and had been for 500 years. As the empire collapsed, Britain and France, the war’s eventual victors, made plans to carve up the territory and graft it onto their own empires (with some much-shrunken allowances for the Ottomans). True, the resulting borders drew bore little resemblance to the natural borders between the various tribes and sects. But probably no plan would have accomplished that goal. First, the sectarian divides had been subsumed under Ottoman rule for so long that even knowledgeable historians of the day had only a vague idea of where the “natural” borders were. More to the point, such borders didn’t, and still don’t, exist. Certain sects and tribes comprise a majority in one stretch of land or another, but they overlap in many more; sovereign states of sectarian purity were always a bit of a dream. Sykes-Picot failed not so much because its borderlines were inadequate, but more because the colonial rulers didn’t stick around to impose colonial rule. The war exhausted France and Britain’s treasuries and their citizenries’ patience with foreign ventures, so their empires began to fray. Two decades later, World War II laid waste to their economies, their governing elites, and whole swaths of their cities—and their empires collapsed entirely. The sectarian strife that we see in the Middle East today might have reared its head 65 years ago had it not been for the Cold War, which carved the globe into two spheres—the American-dominated West and the Soviet-controlled East—just as the European colonialists were retreating. The Cold War wasn’t just a global rivalry; it was also an international-security system through which each superpower maintained stability (with varying degrees of success and brutality) within its sphere of influence. It is no mere coincidence that the ancient conflicts of the Middle East, South Asia, and the Horn of Africa resumed with great zest in the 20th century’s final decade, when the Soviet Union imploded and the Cold War expired. In other words, what we are witnessing in that region today—the convergence of civil wars and sectarian wars, the blurring of borders, the erosion of regimes and of their leaders’ legitimacy—is the volcanic eruption of ancient feuds brought on by the collapse of the Ottoman Empire. Sykes-Picot was an attempt to cap this eruption with new empires, as was the Middle Eastern front of the Cold War. The precise scope and pace of this eruption wasn’t predetermined. Sykes-Picot’s mapmakers exacerbated the violence by sowing ambiguous dreams over Palestine and by excluding the Kurds from a homeland. In more recent times, George W. Bush’s invasion of Iraq accelerated the coming of anarchy by upending the regional balance of power between Sunnis and Shiites. Barack Obama’s passivity in the onset of Syria’s civil war may have intensified the trend. Yet these decisions didn’t change the course of events in the region or shape its vast contours. This is what the deep structures of history look like, up close. From that vantage, it’s hard to conceive a resolution to these crises, and it’s easy to see why current diplomatic efforts, such as the strained cease-fire in Syria, fall short at best. If there ever is an enduring peace, it will stem from drastic changes, whether by evolution, fiat, or a mixture of the two. Jeffrey Itell, senior analyst for Wikistrat, a geostrategic consultants group, suspects it may require a revival of big-power politics, in which the region’s main powers—probably Iran and Egypt (or possibly Saudi Arabia), backed by global allies—impose a peace by carving their own spheres of influence in the area. For the long haul, the region’s countries, large and small, will probably have to create or adopt institutions capable of mediating disputes with legitimacy and thus without violence. This would require some measure of democracy, mass education, social mobility, an opening up to the rest of the world, and a move away from economies so dependent on oil (this dependency being a major enabler of insularity). It took Europe a millennium and a half to resolve its post-Roman crisis of social and political identity; nearly a thousand years to settle on the nation-state form of political organization and nearly five hundred years more to determine which nations were entitled to be states. … The continuing crisis in the Middle East in our time may prove to be nowhere near so profound or so long-lasting. But its issue is the same: how diverse peoples are to regroup to create new political identities for themselves after the collapse of an age-old imperial order to which they had grown accustomed.